When we discuss inclusion in the disability sector, we often engage with issues such as accessibility and equal opportunity. We speak in terms of product design, business goals, and legal requirements. However, these topics rest just on the surface of a much deeper pool of considerations because, at its core, inclusion is a mindset that honors the humanity in each and every one of us. 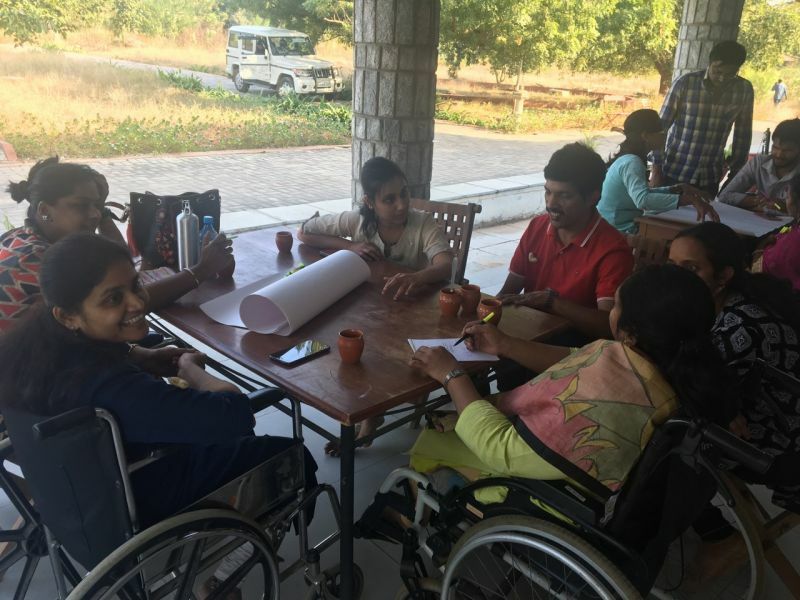 This is among the lessons learned at the second Inclusion Retreat (first one was in ESI Sughad in 2016), held 11-13 December at Naimisam (the Jiddu Krishnamurti Centre). Located an hour’s drive outside of Hyderabad, Naimisam is a meditation and retreat center and a “space of deep discovery” according to its caretaker, Aparajita Rao. The Inclusion Retreat addressed the concept of inclusion from a unique perspective fueled by personal stories of kindness and compassion. The forty participants came from diverse backgrounds: NGOs, the corporate sector, and individuals with disabilities and allies. In what ways can we give back to society? What scares us about serving others? How can we overcome these fears? How can we support others’ intentions in their work? These are big questions with myriad answers. Luckily, we had the right people who helped us hold these questions with care and concern. 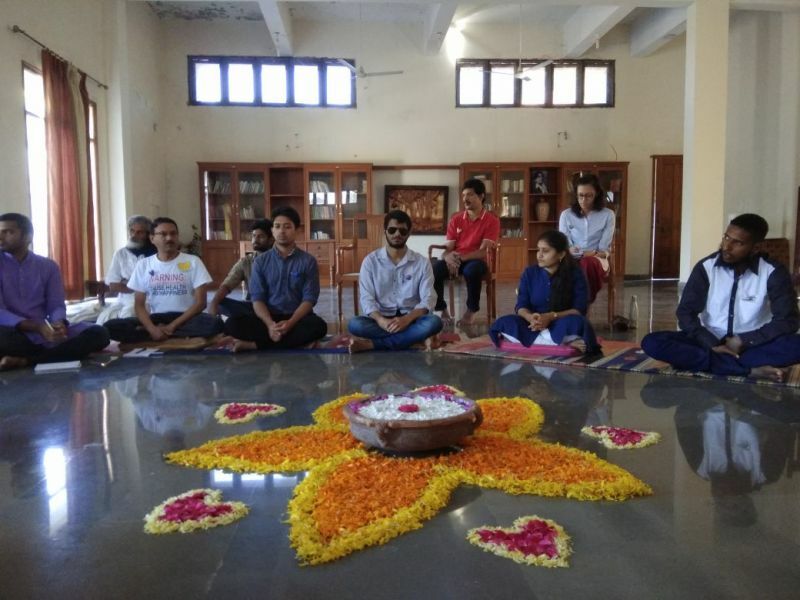 Jaideep and Priyanka Agarwal introduced the space by expressing their desire to give to others and welcomed the family of service as they put us all to think and share one moment when we felt oneness. What emerged was a prominent theme--that inclusion is a manifestation of oneness--through stories about the origins of our disabilities, our proudest moments, and how we feel connected to others. Not so surprisingly, most of us felt the connection when we served selflessly and when we made a difference to our lives and to people around us (sometimes absolute strangers). 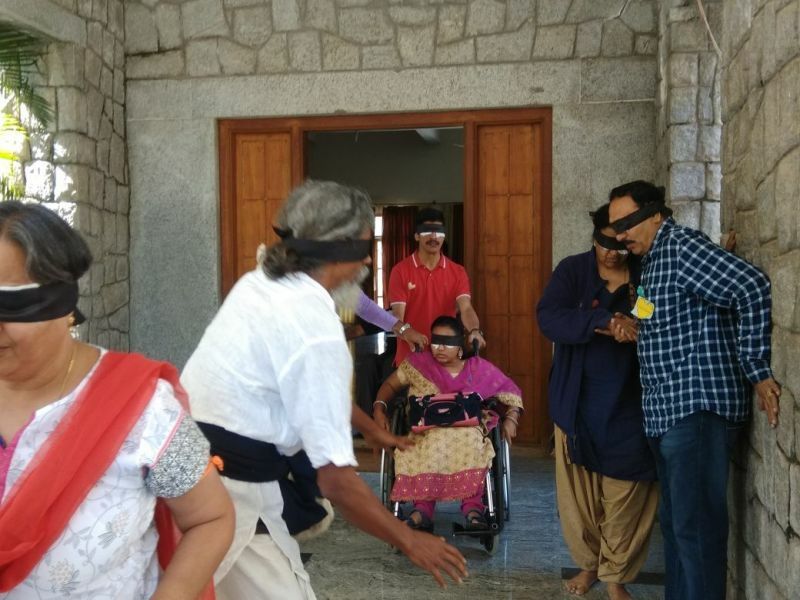 Omair Ahmed, who sees disabled as differently abled and visually impaired as visually empowered, complemented Mohan’s thoughts that oneness happens when one is recognized. Gopala shared a moment when he and a dog became companions without a conversation in a dark deep jungle. 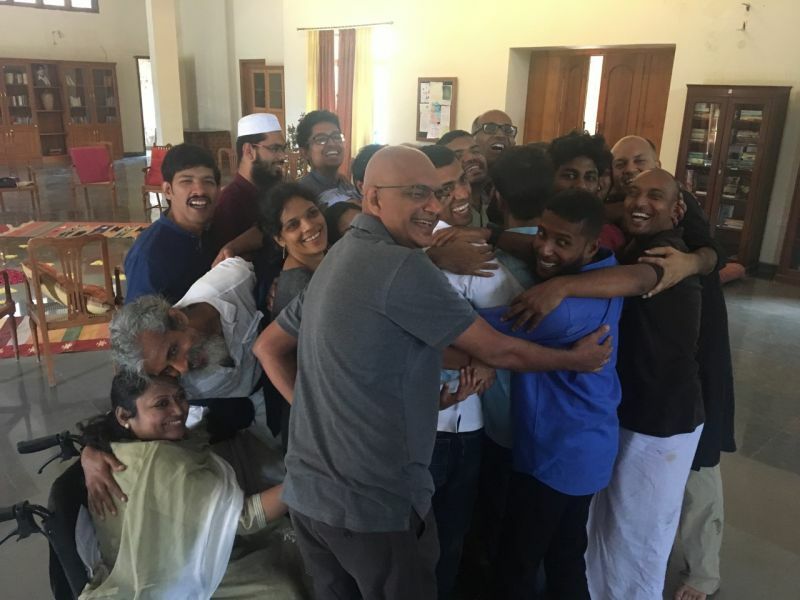 The feeling of oneness and connection is truly the language of the heart, quoted Salil. For Rahul, storytelling became the window to the oneness as through device play, as he created stories from the stories of his participants. Priyanka Peeramsetty felt oneness when she truly experienced Vasudhaiva Kutumbakam as the whole world has tiny parts of our own selves. Nipun remarked that these “moments of twoness” go on to create ripples as movements of collective oneness. In an informative session, Suchitra Shenoy took us through “business models for empathy and compassion” as she shared the story of Dr. Govindappa Venkataswamy (also known as Dr. V), a government employee-turned-ophthalmologist. Dr. V’s goal was to eradicate needless blindness for those who need the help the most. He founded Aravind Eye Hospital on a commitment to free high-quality eye care to all. His mission gave jobs and treatment to people from all backgrounds, without discrimination and regardless of their ability to pay. (“How We Give”) Using this model, Suchitra described the need for purpose-driven, replicable business models to share their methods with other organizations—to make them “open-source,” in a sense, so that we can all benefit. Compassion does not equal having a soft heart, but the question is how can one build it into a system? The road to that journey is understanding and deeply applying sympathy (“I feel for you”) and empathy (“I feel with you”). What we realized was that, to create inclusiveness in its truest sense, organizations have to be purpose-driven. Organizations should also create an ecosystem which will have the holistic setup for all actions and stakeholders. And when organizations create replicable models of a great benchmarking goodness, it is impossible for it to not inspire others. Meera Shenoy spoke about changing attitudes, as that is the biggest roadblock in creating inclusive communities in our society. When her work gives recruiters no choice but to recruit people with disabilities, the corporates’ journey of inclusion is strengthened, which is her way of writing about issues versus doing about issues. It was incredible to understand that purpose truly is not money or knowledge, but service. To serve, one must stretch oneself to do the most and give nothing but the best. And lastly. to always seek the most undoable--not the low-hanging fruits--is the sustainable way of serving others around us. In an open house of understanding perspectives of various stakeholders in our system, we resonated the importance to change attitudes on the hiring side of the equation from needy (of infrastructure) to needed (our innate talents to give error free results). The three Ts of employing people with disabilities are Transactional, Technological, and Transformational. And the most important pre-step for everything is awareness--it is a huge dimension of inclusion. Then came the soul-stirring account of Nipun’s narrative of the role of compassion in a life of service. Nipun shared that great friendships come from sharing hearts and deep connections only form when we serve others together. In an age when we are in a “chain of hurt” as hurt people hurt other people, the question he posed is how do we become wounded healers? Because healed people can heal other people and that’s a resource we can’t let go. Often we de-escalate into a line of thought that we do not have enough means to embark on a journey of change, but with a small group of 50 people, there are 100 million trillion possible connections. One important shift we all need to recognize is to move from being a consumer to a contributor. To shift from market-based dynamics to complete generosity-based patterns, we need the triad of sympathy, empathy, compassion. When aimed with good intentions, our desires to connect with others can have a huge impact on the global service sector. To institutionalize compassion at a systemic level from a personal level, we should start seeing mutual vulnerability as the bonds of trust. This discussion wouldn’t have been as effective if we did not get a chance to experience what it is to be in an “unknown zone.” We were all blindfolded to get our mid-day drink, ragi malt. As one would guess it, the only way to complete that simulation is by collaborating and joining hands (quite literally). The quest for a drink brought us all closer to the definition of failure and success. Being together changes all of that into a single word: learning experiences. In the breakout sessions that followed, the cohort spent time sharing and shaping our “passion projects”: what is the audacious dream we have and how can we attempt to reach it together? 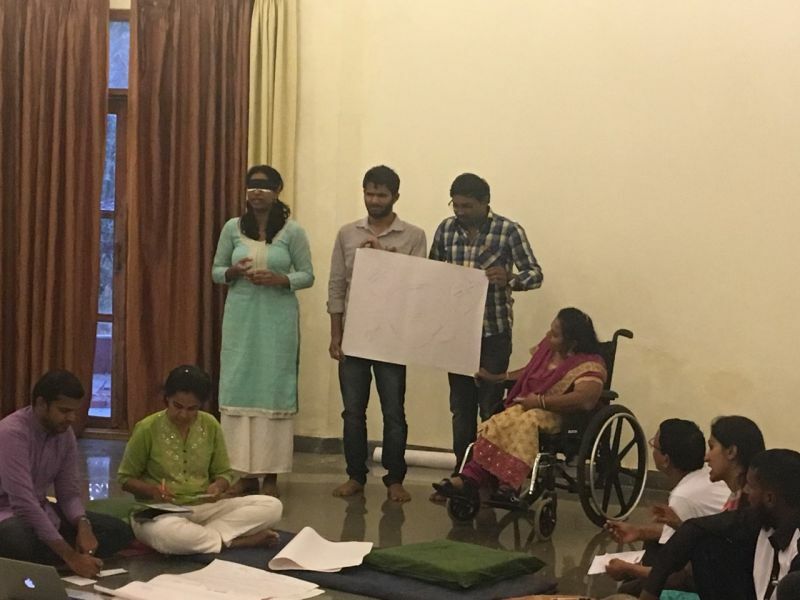 Inclusive University: Creating an immersive experience in an academic setup to unlearn all our conscious biases and stereotypes about the differently abled. What emerged through these sharings was beautiful as we echoed the need to amplify the strengths of role models in people with disability and the caretaker community; these will trigger conversations building narratives on compassion rather than sympathy. In a tech world, building a MOOC (massive open online classroom) for compassion and inclusion like Science of Happiness is a way to start thinking about inclusion in their daily lives. And of course, hosting inclusion circles to facilitate and enable distributed volunteer group is an ongoing journey we all can take as individuals. In a light-spirited evening, we dwelled in the magic of a Mimo magician and learned sign language together over laughter and hugs, to let the children inside us embark on a mini-journey of rediscovery of ourselves. Spending the morning at the Meditation circle under the Chaaya of the selfless tree, we acknowledged the friendships that gave us what we needed selflessly. In a language of thanking our ecosystem, we all walked back in silence to the hall - only that we bowed to Mother Earth for our every third step on the path. Concluding circle and final thoughts were done in the bliss and the gratitude of the august company we have. There were moments of uninterrupted joy and moments of established longing in our goodbyes, but this is only the beginning of a better dawn towards inclusion--that our hearts agreed in unison. Today, i am not expected in this situation, i saw your facebook clippings, unexpectedly visit your marriage photo's, right now i am veryfing another information , suddenly show the surname and your personal name and marriage photos and video's.